Emergency Rule in effect until Dec. 31, 2013! The daily bag and possession limit has been raised to 8 trout. This change is effective from July 15, 2013 to January 1, 2014. Anderson Meadow Reservoir will be drained this fall to complete repairs to the outlet structure. Low water levels at the lake will likely result in the lost of trout. Limits are being temporarily liberalized to allow anglers to harvest trout that would otherwise be lost. Anderson Meadow Reservoir is high in the Tushar Mountains east of Beaver. It is a small artificial lake in a high meadow. The reservoir was built by the DWR to create a fishery. 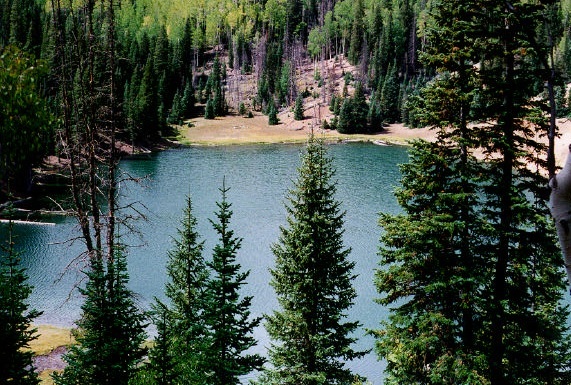 The reservoir shoreline is owned and administered by the Fish Lake National Forest with unrestricted public access. Water is used for coldwater aquatic life and recreation. Anderson Meadow Reservoir is accessible from FS-137, a gravel road across the north slope of Circleville Mountain also passing by Kents Lake and LaBaron Lake. FS-137 both originates and terminates at intersections with U-153, the road from Beaver to Junction. Fishing, boating, and camping occur in the area. Recreation use of the area is usually heavy. Although there are no developed boat ramps, a small boat can be launched in the reservoir. Anderson Meadows Campground, maintained by the Forest Service, is adjacent to the reservoir and offers camping at a nominal charge. It has 10 campsites with drinking water, vault toilets, and charges user fees. There are other USFS campgrounds in the vicinity as well as several private campgrounds in Beaver.